A big thank you to Marcia for originating Mailbox Monday. In this weekly meme you share books which came into your home during the week. I reserved some books at the library this week and heard of some through BookBub. What Ellie doesn’t anticipate is Graham’s infuriating best friend, Tuck, tagging along for the trip. Nor did she imagine boys going missing amid rumors of impossible kidnappings. Least of all does she expect that something powerful and ancient will awaken in her and that strange whispers will urge Ellie to claim her place among mythological warriors. Instead of peace and quiet, suddenly there’s a lot for a girl from L.A. to handle on a summer sojourn in Norway! And when Graham vanishes, it’s up to Ellie—and the ever-sarcastic, if undeniably alluring, Tuck—to uncover the truth about all the disappearances and thwart the nefarious plan behind them. Deadly legends, hidden identities, and tentative romance swirl together in one girl’s unexpectedly epic coming-of-age. Bored administrative assistant, Tessa Golden, is trapped in a life of lousy weather, irritating bosses, and mind-numbing secretarial work. Her dreams of being an artist have rapidly deteriorated into building things out of paperclips while on hold with tech support. To make matters even worse, the love of her life has gone off and married another woman. So when Tessa is suddenly transferred to the Las Vegas branch of her company – playing wingwoman to her freshly divorced boss, juggling a client-from-hell, and catching the eye of one very eligible coworker – will her life finally be shaken up enough to straighten itself out? A big thank you to Marcia for originating Mailbox Monday. This weekly meme is now on tour with a new host each month. April’s host is Mari of Mari Reads. Locke & Key Volume 2: Head Games by Joe Hill and Gabriel Rodriguez. A big thank you to Marcia for originating Mailbox Monday. This weekly meme is now on tour with a new host each month. March’s host is Caitlin of Chaotic Compendiums. The 2013 Campbellian Pre-Reading Anthology which features short stories from writers nominated for the John W. Campbell Best New Writer award. A big thank you to Marcia for originating Mailbox Monday. This weekly meme is now on tour with a new host each month. February’s host is Audra of Unabridged Chick. The Threshold Child by Callie Kanno for review. Adesina was trained from childhood to serve her land as a warrior and a spy. When she is selected to combat a group of seditious magic users, she must summon all of her talents–some of which have been buried in the deepest part of her. Shadows and Secrets (Annals of Wynnewood, Book 1) by Chautona Havig. No one knows what the cloaked creature is or why it is so terrifying. The villagers of Wynnewood only know that they must stay away from “the creature” for fear of their physical and spiritual safety. An unfortunate encounter with a dragon introduces Philip Ward to the creature, and to his surprise, he finds a friend, confidante, and companion in more adventure than he’d ever dreamed possible. Follow Philip and the creature as they rescue a lame child, discover “pirate treasure,” and test the mettle of true friendship. Shadows & Secrets is the first book in the Annals of Wynnewood. Hellbender by Jason Jack Miller. Although the Collins clan is steeped in Appalachian magic, Henry has never paid it much attention. But when his younger sister dies mysteriously Henry can’t shake the feeling that the decades-old feud between his family and another is to blame. Strange things are happening at the edge of reality, deep in the forests and mountains of West Virginia. Let Jason Jack Miller take you to a place where love is forever even when death isn’t, where magic doesn’t have to be seen to be believed, where a song might be the only thing that saves your soul. Jason Jack Miller’s Murder Ballads and Whiskey series is a unique blend of dark fiction, urban fantasy and horror. It’s Appalachian Gothic, Alt.Magical.Realism, Hillbilly Horror. It’s American Gods meets Justified. True Blood with witches. It’s Johnny Cash with a fistful of copperheads singing the devil right back to hell. A big thank you to Marcia for originating Mailbox Monday. This weekly meme is now on tour with a new host each month. January’s host is Lori of Lori’s Reading Room. Two books came into the house this week. Troll or Derby by Red Tash for review as part of the Heroines with Heart January tour. 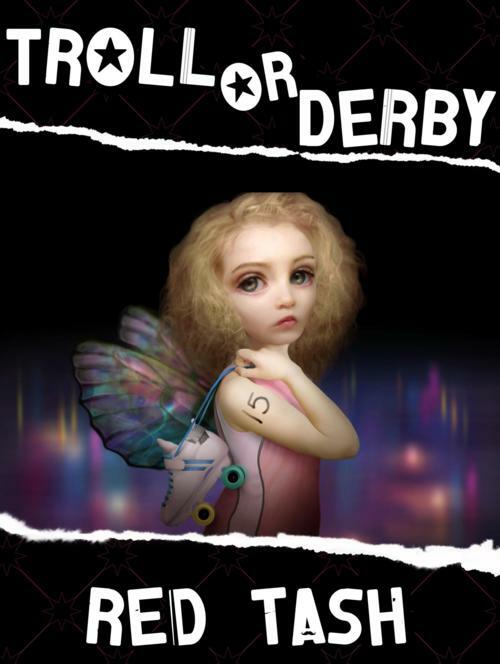 In Troll Or Derby, fifteen-year-old Roller Deb is singled out by town bullies for both her skates, and for being different. When her popular homecoming queen of a sister is kidnapped by a scuzzy drug dealer, Deb must flee the trailer park in which she’s grown up, and rescue her. Along the way, Deb becomes enmeshed in the magical realm of trolls and fairies, and the blood-thirsty version of roller derby at which these beings excel. But spending too much time among the fairies comes with a price. Will Deb choose to save her sister, with the aid of a mysterious troll? Or will she be lost to the lures of roller derby, and this magical new realm, forever? The other book is Wolf Hall by Hilary Mantel so I could participate in the readalong with It’s All About Books and The Bluestocking Society. I can’t recall the last time it was so difficult for me to get my hands on a book. Both nearby libraries had all their copies checked out with long waits. Overdrive’s 6 audio copies were checked out. I went to the bookstore on Sunday and there were no copies with Mantel’s other books. I finally found three copies on a love themed table in the back. England in the 1520s is a heartbeat from disaster. If the king dies without a male heir, the country could be destroyed by civil war. Henry VIII wants to annul his marriage of twenty years, and marry Anne Boleyn. The pope and most of Europe opposes him. The quest for the king’s freedom destroys his adviser, the brilliant Cardinal Wolsey, and leaves a power vacuum. I’ve been checking out quite a few books from the library recently or trying to get through my TBR pile. I did receive some LibraryThing Early Reviewer winnings. The Burning Time by J.G. Faherty. The Stranger has come to open a gateway to the Elder Gods. One country mage with the help of a woman and teenage son will have to defeat him. Forever Man by Brian W. Matthews. Police Chief Elizabeth “Izzy” Morris enjoys keeping the peace in the small town of Kinsey in Michigan’s Upper Peninsula. But when her seventeen-year-old daughter goes missing after a school dance and the mutilated corpse of the girl’s date is discovered in the nearby woods, Izzy’s police skills are stretched to their limits. A big thank you to Marcia for originating Mailbox Monday. This weekly meme is now on tour with a new host each month. December’s host is Suko’s Notebook. My list of books keeps growing and I keep pushing off this meme because the list keeps growing. For now, so I can finally say I did one of the memes this month I’ve got one book to list. Ink by Damien Walters Grintalis. It’s a horror book about a tattoo gone wrong. I’m not really into horror but I’m friends with her on Twitter. Her daily tweets about writing and the excitement over Ink tipped me into making a purchase. It was a fast read and enjoyable. Review coming soon. A big thank you to Marcia for originating Mailbox Monday. This month’s host is Kathy of Bermudaonion. It was a light week for me. I received an ebook copy of Remnants of Life: Legends of Darkness by Georgia L. Jones from First Rule Publicity for a December tour. It’s an urban fantasy novel in which the main character dies and comes back as something else. I think that would be qualify as anyone’s bad day. A big thank you to Marcia for originating Mailbox Monday. The host for November is Kathy of Bermudaonion. I received a copy of Lee Martin’s Break the Skin for review from Crown Publishing. He’s a local author. Lastly I bought Monster in My Closet by R.L. Naquin. She was one of the authors at the Coyote Con.